Somerford is a parish in Cheshire East. It is situated 3 miles to the west of Congleton. It is gently undulating with the land falling away to the north towards the River Dane which roughly follows the boundary of Somerford. It also has Loachbrook flowing through the parish. As well as both these watercourses there is Goodwins Pool a fishing lake very popular with anglers. There is a bridge over Loachbrook on the A54. There is another bridge on the A534 and yet another larger bridge over the River Dane at Radnor Bank. Most of the land is of a high agricultural grading and the area has a lot of farms. It is predominantly rural. Somerford has its own unique identity and character as an individual community, separate from the neighbouring town of Congleton. There are no street lights in Somerford and the dark skies are valued by the residents. A large portion of the development is ribbon development along Blackfirs Lane, Chelford Road and Holmes Chapel Road. The rest of the development is scattered throughout the area. It is a very popular area for walkers, runners and cyclists. Historically there was a large manor house which was home to successive generations of the Shakerley family. This was used as a military hospital in the First World War. Within the grounds in the Second World War many evacuees were housed in a camp. Unfortunately the manor house was demolished in 1928 due to death taxes. Though a small parish there is plenty of employment, most of which blends in to the countryside unobtrusively. There are employers of over 30 people and there is a small office development that hosts various offices. The grounds of the aforementioned manor house is now an equestrian centre which holds regular events. This also hosts associated equestrian businesses within its grounds. Throughout Somerford there are plentiful trees, some with tree protection. Away from the main road the subsidiary roads mostly have wide grass verges instead of pavements, all planted with various trees and lined with hedges. All this greenery affords a lot of protection for the wildlife. Together with the site of special scientific interest and the sites of biological interest along the River Dane this all make Somerford a very special place to live, work and to visit. 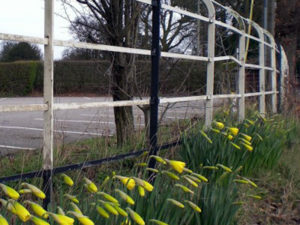 Cheshire railings, the black and white fencing with a curved top at road junctions and bends is a unique feature of the county’s highway landscape dating back to 1929. They were introduced as a safety measure. There is a great debate as to whether the uprights should be one black and two white or one black and four white. An example can be seen at the junction of Chelford Road and Holmes Chapel Road. 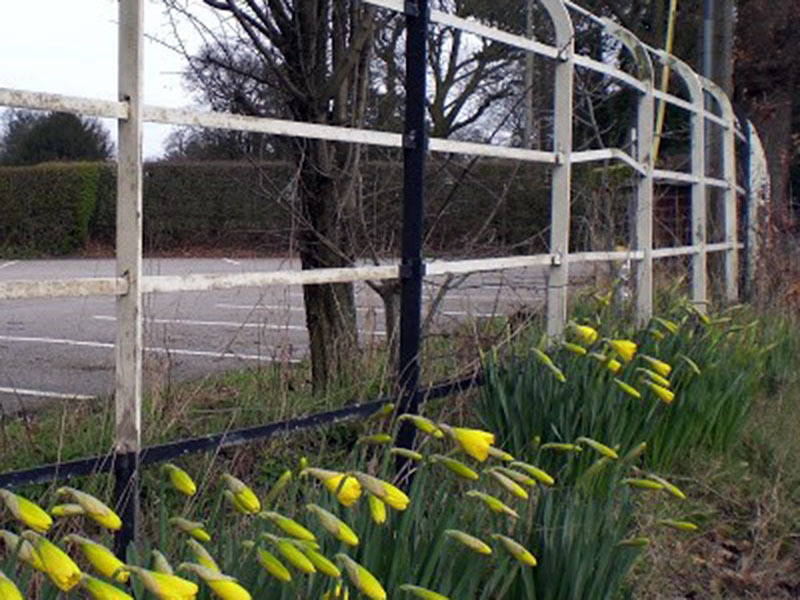 Somerford Parish have taken pride in their local landscape and heritage and some of the existing railings have been maintained.